Tub/shower combo, hair dryer, towels and wash clothes provided. Detergent provided for the washing of towels and sheets. Guest should bring own detergent for person items to be washed. Has parking space at side of cottage. Couch and two chairs, coffee table and side table. Tv, dvd and CD player, DVDs, CDs, and games. Salt and Pepper, trash bags, and paper towels proved. kitchen is very well equipped and has ice maker, coffee maker, blender, microwave, toaster, dishwasher, pots and pans. Netflix is provided. Due to the location, cable and satellite are not available. Super clean and Natalie was very responsive to all my questions. Seriously, just bring some groceries and stay a few days. You will leave relaxed and rejuvenated. We really enjoyed the cottage! It was very clean and inviting. We would highly recommend to anyone wanting a romantic and relaxing weekend. Thank you, Natalie! We will definitely be back! 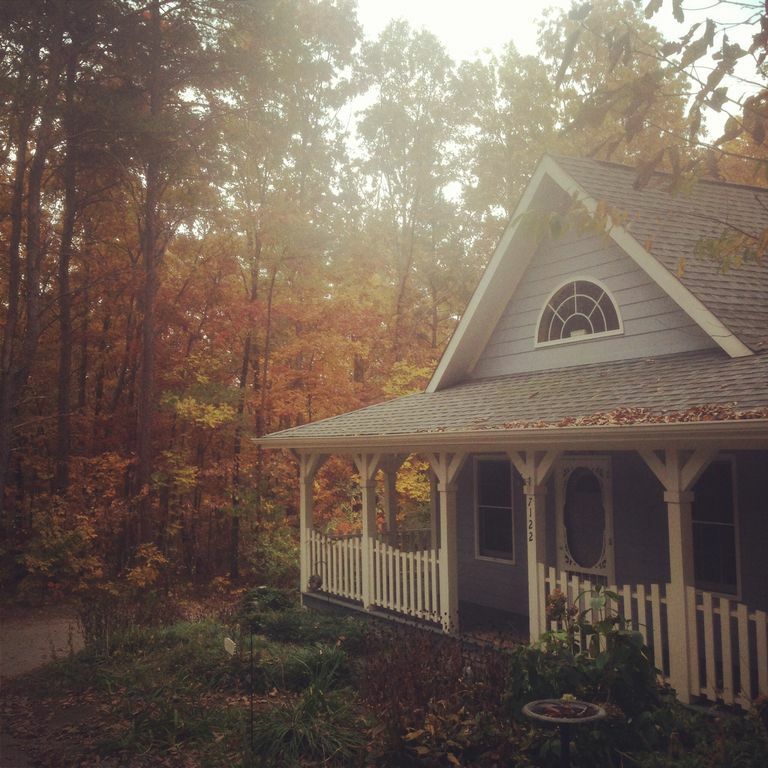 The cabin is for dreamers, fantasy, and over all relaxation. It's very well equipped with eclectic furnishings...lots of color but wasn't expecting the beach scene...different but sweet. First day, there was a bit more traffic than we would have anticipated as we did not know the owners are just behind the Blue Cottage. To the right is another homestead that we clearly could see out the kitchen window. The outside is well taken care of...we had no use for the upstairs swing bed. My suggestion is a full bed instead. The inside was very clean when we arrived. After the first day, traffic was much lighter. One day the owners came and watered the plants and my husband and I were not comfortable with the lack of privacy in regards to vrbo's are usually not attended to by the owners. The owner did message us on vrbo, but on a vacation I don't check vrbo and it would have been nice to either waited to water the plants or asked us to, waited until we were there, or just came down for introduction. It made the remainder of the trip feeling our privacy had been over-stepped some what. There is a very skinny cat, you can feel its bones and I was very saddened of the condition of the cat. I wanted to feed it but wasn't sure that was a good idea. The hang gliding is at the end of the driveway, that was awesome. The other attractions are super close, maybe 15 minutes, a big plus. All in all, this was a nice vrbo, and we have stayed in several. I have never been asked to wash towels prior to checking out, usually its put the towels on floor, dont make bed...but again, these are small things. In the future we would stay here again, but we really like our privacy more than this beautiful cottage provided. It is put together with lots of love and soul. Thank you Natalie and Jim for allowing us to be part of your paradise...wish you all nothing but the best in life!! Nancy, thank you so much for your wonderful feedback. I always love to hear back from guests to know what is right and what is wrong. I worked as a customer service specialist for many years so I understand the value of feedback. At the time of your visit, we were in need of rain and the landscape was in desperate need of being watered, and too costly to let die. Sorry that watering the landscape made you and your husband uncomfortable, it was not our intention to do so. We try hard to make our guests feel comfortable and we greatly respect their privacy and would never visit without giving a heads up, as you were given. As far as loading towels into the washer before checking out, that is no longer asked of guests, instead we have joined the vast majority of owners and now charge a cleaning fee at time of booking. The black cat lived at the cottage since he was a kitten. He was 4 years old. He brought joy to many guests that loved his gentle nature and found pleasure in his company and giving him a name. He has since been put down. I hope with these changes that you’ll return and your next visit will be nothing short of perfect. Thanks again. I loved Blue Cottage and highly recommend it! The Blue Cottage is fabulous for its charm, peacefulness, and artistic decor. Great place to retreat to enjoy Lookout Mountain! And the surrounding Chattanooga historical sites. A charming getaway especially for those that love nature. My wife and I enjoyed our stay at the Blue Cottage and found it to be extremely relaxing. Being nature lovers we especially enjoyed all the plants and flowers in proliferation around the cottage. My wife fell in love with the resident cat who even made friends with our two dogs....quite the goodwill ambassador! I would highly recommend it to a couple (it's small so not really for a large family, maybe someone with one child) for a few days of peace and tranquility. The firefly show every afternoon at dusk was spectacular and quite magical....I got some great photographs!! Small and quaint. Perfect for our simple honeymoon!! Loved the cottage cat...so sweet. Property is located atop beautiful and historic Lookout Mountain, within walking distance of the Lookout Mountain Flight Park (hang gliding launch site), and short drive of Cloudland Canyon State Park, Rock City, Ruby Falls, Point Park and Lula Lake Land Trust. There is Mom and Pop store a couple of miles from the cottage where you can purchase fuel, and basic grocery items. Major grocery stores are located in the valley. As for restaurants, a very nice and popular restaurant 'The Canyon Grill' is located about 4-5 miles south of the cottage. There are many restaurants in Chattanooga, a scenic 20 mile drive away. The area offers an abundance of outdoor activities, with hiking and biking trails an easy drive away. Please feel free to contact owner for recommendations.